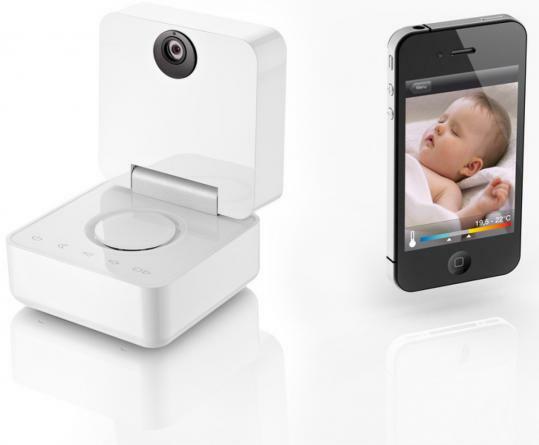 A new baby monitor for the iPhone will provide better pictures from the nursery than you could have snapped with most digital cameras only a few years ago. The French health-monitoring technology company Withings (www.withings.com) introduced its Smart Baby Monitor last week at the Consumer Electronics Show (CES) in Las Vegas. The device, available in March, has a 3-megapixel camera with a wide-view lens and infrared night vision. The monitor folds out to sit on a table and connects to your iPhone via Wi-Fi or Bluetooth. If you do not own an iPhone, you can connect the monitor to an iPad, another smartphone, or a desktop PC. The device, though “made with the iPhone in mind,’’ according to a company statement, also connects to personal computers by wire. The Smart Baby Monitor does more than deliver a picture. It doubles as a motion detector and has a microphone to capture sounds from the room. It also relays temperature and humidity readings to your iPhone. You can also use your iPhone and the Smart Baby Monitor to control the music playing in your nursery and to set alarms that chime when the room gets too hot or too dry, for example, or when your little one’s cries reach a certain volume. Withings last week also announced details on its blood pressure monitor for the iPhone, iPad, and iPod Touch (about $130 and available this month). When you plug the blood pressure monitor cuff into your iPhone, it automatically launches the app Withings developed for use with the device. All you need to do then is wrap the cuff around your arm and push the start button on your Apple gadget. The monitor automatically averages your blood pressure measurements and sends all of the data to a secure website, according to Withings. Also from Withings: At CES, the company announced that users of its digital WiFi Body Scale can track their weight on Panasonic televisions, via Panasonic’s Viera Connect apps system. Here’s some good news if you want to been seen at Starbucks with a gleaming new tablet but balk at the cost of an iPad. The Breeze has an 8-inch, 800x600 pixel touchscreen. It connects to the Internet via Wi-Fi but also plays media from devices connected via USB. The tablet has 4GB of built-in storage and a micro-SD card slot and comes preloaded with a Web browser, e-mail, a calendar, and a link to the Android marketplace for locating additional apps. The Breeze has a built-in microphone but no camera. It should give you several hours of audio and video playback from a single charge.